That’s the question that occurred to Ben Davis as he was sitting outside the San Francisco Ferry Building one Saturday morning in September 2010, gazing at the western span of the San Francisco-Oakland Bay Bridge. Not long after, he got a chance to propose the idea to New York artist Leo Villareal—and now he’s running a non-profit dedicated to using the bridge as the framework for a massive Villareal “light sculpture” called Bay Lights. The plan, if enough money can be raised, is to mount 25,000 individually addressable LEDs on the bridge’s suspension cables, turning the iconic structure into to a giant display for a shimmering, never-repeating constellation of patterns. (You have to watch the video rendering below, created by two employees at Pixar, to fully grok the concept.) 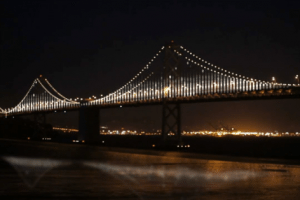 The two-year, $8 million light show would come at a key time in the Bay Area, coinciding with the America’s Cup regatta, the opening of the new eastern span of the Bay Bridge, the completion of the new Exploratorium, and several other signature events. Analysts predict it could be seen by as many as 50 million people and bring the city $97 million in added tourist dollars. Private backers, including prominent Bay Area entrepreneur-investors such as Ron Conway, Matt Mullenweg, and Adam Gross, have already committed $5 million for the project. But there isn’t much time left raise the rest. Davis says Caltrans, the state agency that controls the Bay Bridge, wants the organization to show it has $7 million in the bank before construction begins in July. “It doesn’t happen if we don’t raise $2 million more by July 1,” he says. So Bay Lights is appealing to the technology community to help it complete a crash fundraising effort. The organization is urging Bay Area entrepreneurs and engineers to use social media, including Twitter and Facebook, to form teams of contributors. The teams that raise the most money but June 30 will win a variety of perqs, such as an invitation to a City Hall reception with Villareal and civic leaders. The top fundraising team gets a dinner with Villareal and invitations to the grand lighting gala and VIP pre-party.